It's never too early to get fit! Yoga is a fantastic way to get healthy, develop mindfulness and body awareness, build concentration, manage stress, and more. So say "om" and check out one of these local Marin and San Francisco Bay Area kids' yoga classes. 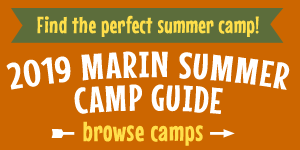 We've listed them by location, and included classes in Marin, San Francisco, and Sonoma County. The Tam Valley Community Center offers Yoga for Athletic & Energetic Kids, a new class for kids in grades 2–5. Sports Basement offers a Yoga and Mindfulness for Kids class on Mondays for children ages 2–5. Drop-in or sign up in advance. Sukha Yoga offers Yoga for Kids "Tweens" for boys and girls ages 8–12. Enhance flexibility and strength, develop focus and attention, strengthen mind-body connection, and more. $12 drop-in or $70 for 7 classes. Marin Power Yoga in San Anselmo offers Kids Yoga Tuesdays and Thursdays for kids in kindergarten through 6th grade. Children who are mature enough can attend regular vinyasa yoga classes. They offer yoga birthday parties, too. Embrace Yoga in San Rafael offers kids' yoga classes. Wee Yogis introduces yoga classes for kids of all ages to yoga and mindfulness through fun, interactive, and effective learning environments and transformative media. The Sports Basement store in the Presidio of San Francisco offers a free Yoga for Kids class and Yoga and Mindfulness for kids. Children's Yoga Center offers yoga classes for both kids and adults in the Sonoma Valley area, as well as yoga day camps.